AllGems Limousine Transportation offers professional Business Meeting transportation services in Orlando and throughout Central Florida. The Orlando and Central Florida business community is vast and involves many types of industries, making Orlando an important business hub for the United States. When you or your associates require professional and reliable business meeting transportation, AllGems is unmatched in providing such services. If your business meeting destination is an office building, hotel, restaurant or dining facility, a home, or other location, AllGems Limousine Transportation is ready to provide you the professional service which you require. 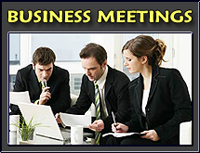 We offer professional, courteous, and dependable Business Meeting Transportation Service that is second to no-one. Our transportation vehicles are impeccably maintained, clean, and always in top operational readiness. Contact us today for your transportation needs at 407.438.3074 (locally), or outside the Orlando area at Toll Free 1.877.625.GEMS (4367) for a free estimate and to reserve a limousine or luxury sedan.